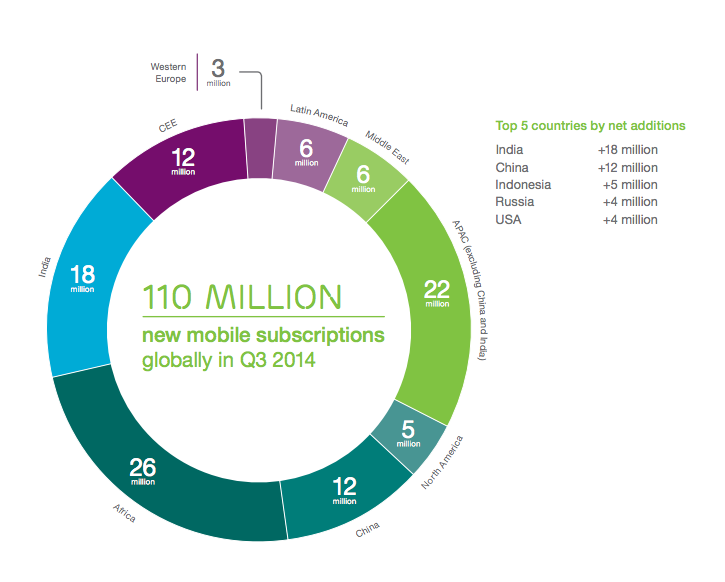 Globally we will tip the 7 billion mark for the total number of mobile phone subscriptions, with 7.1 billion active users of handsets in 2014, and smartphones accounting for 2.7 billion of those. In what Ericsson CTO Ulf Ewaldsson described to me as a “strengthening” of mobile growth globally, these are not the only numbers that are continuing to rise. Today, on average, smartphone users are consuming 900 megabytes of data each month and by 2020 that number will top 3GB — led by the rise in popularity of video and other media streaming. Tablets and mobile PCs — with larger screens more conducive to watching video — are already passing the gigabyte mark, gobbling up on average 1.9GB and 4.3GB each month. As for what device brands are leading the charge for usage, Ewaldsson also reaffirmed to me what we have heard many times before about this: those who use Apple’s iPhone and iPad are more data hungry than those using Android or other platforms. “It’s not that the devices themselves are data hungry,” he says. “It’s just that Apple users are more active.” This explains why carriers have always been good friends to Apple — despite having to play second fiddle to Apple when it comes to value-added services like apps and payments. Interestingly, while tablets apparently are slowing down in terms of sales, they are not in terms of usage: of all the devices that run on mobile networks, tablets have the highest CAGR and multiplier of growth compared to smartphones, mobile PCs or all mobile data overall. Its CAGR is 60% and a multiplier of 15, versus CAGR of 40% or 20% and multipliers of 3 and 8. Ericsson — a supplier of equipment to carriers for mobile networks who also operates those networks on carriers’ behalf (it does so for Sprint in the U.S. for example, and in total covers 1 billon subscribers globally) — based its research on anonymised data gathered from over 100 networks and hundreds of millions of mobile phone users. Today, countries like Russia have passed the over-100% penetration mark in terms of smartphone usage — meaning that those who are using phones, are often carrying more than one. Now that trend is playing out to a point where just about every adult — not only the most avid users — are going to be equipped with a mobile device. 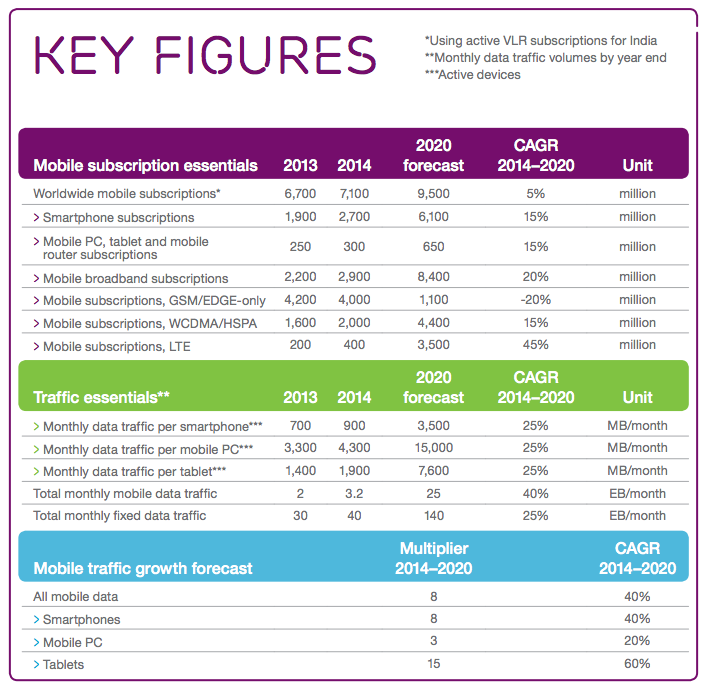 Ericsson forecasts that by 2020, 90% of the world’s population will own a handset. 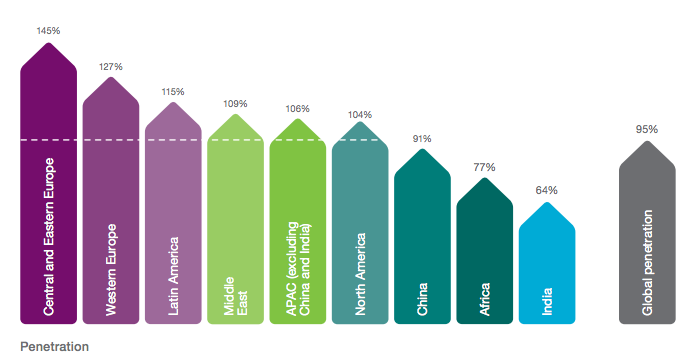 Breaking down regional developments, you can see what parts of the world have slowed down due to saturation and which countries still have a lot of room to grow. Africa, the worst continent when it comes to teledensity, will continue to see the biggest rises. This year, it will add 26 million subscribers for mobile services — the highest of any region, with APAC, excluding China and India, second at 22 million.